To export raw data for your own purposes, choose Export > Export to... From the Buddy. 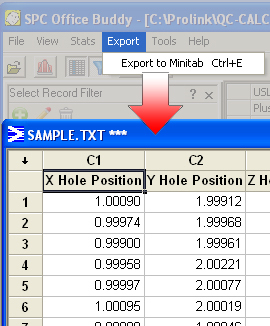 Buddy can export to Minitab, JMP or straight to Excel. If a subset of data is needed, highlight a few cells on the main screen and export it. It doesn't get any easier than the buddy! In the JMP export, there is a configuration that allows you to optionally run JSL (JMP Scripting Language) both before and after the export. So, in JMP, take your favorite report and get the script to run it. Then just paste it into the JMP Export Configuration in the Buddy and you're ready to run your reports straight from the Buddy. There are extra configuration options within the Excel Export that allow you to tell the Buddy where to put the data in the spreadsheet. Simply tell it the starting cell and optionally choose checkboxes for exporting nominals or tolerances. Alternatively, create an Excel Job for more robust reporting.